I would like to think that I possess tremendous self restraint as far as desserts are concerned. Considering the amount of sweets I bring home on a daily basis, I ended up eating only 15-20% of them. May I also add that ALL of them are temptingly delectable? However, like everybody else, I have an achilles' heels. As it happens, lemon cream tart is my greatest weakness. After I took some pictures of the tart this morning, I cut a slice for a cross section picture. I could barely wait to devour my allocated 15% of the tart.I need to know if it tasted better than Dorie's version, which has been my favorite so far. 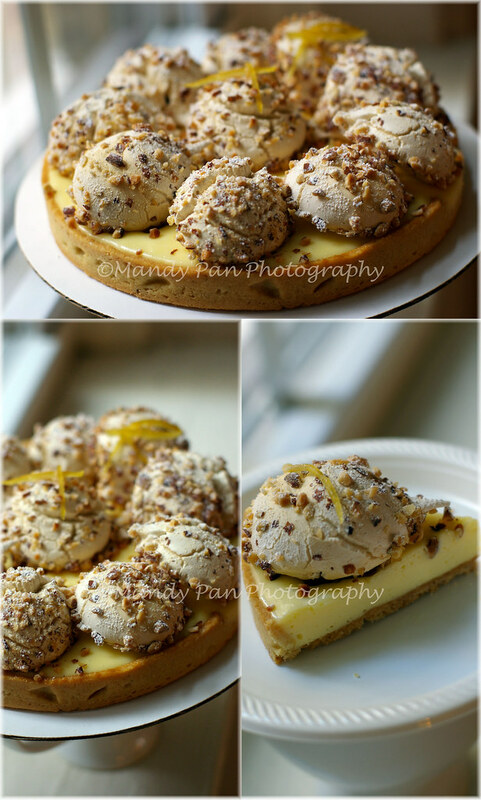 When I got back from school with another tart this evening, I couldn't shake my mind off the lemon cream tart! I felt like a married woman who was still thinking of her ex boyfriend. So I did something unprecedented - I cut out two more slices: one for now, one for tomorrow. Knowing fully that I should reserve some for my friends A & D who are visiting this weekend, and OCT who are coming the following week. So is it better than Dorie's Lemon Cream Tart, you ask? I think both are equally good.I love both of them. The school's recipe uses some gelatin, which gives a firmer lemon cream and cleaner cut, when one slices into it. Dorie's version set softer, which in my humble opinion has a nice mouthfeel. Both are lemony, delicious and would make any lemon lovers really happy. The french meringue shells were first piped, baked and arranged on top of the lemon cream when assembling. Although chef said the meringues are optional, I like the contrasting texture of the various elements in this tart. There's another lemon tart we made at school, with lemon curd as filling and topped with italian meringue. Something like the lemon meringue pie in one of the past Daring Baker Challenges. I wouldn't know how it tastes because it went home with my partner. But I bet it's pretty darn tasty! It may sound crazy, but if I could squeeze in some time tomorrow, I may use my scrape dough to blind bake another shell and fill it with meyer lemon curd! That would make me really happy. Tart is something I don't bake very often in the past. It was a humbling experience seeing more than one side of my tart collapsed yesterday. It was equally nerve racking when the dough cracked at the bottom before I sent it to the oven this afternoon. Chef reassured me that it'd patch back on its own under the oven heat but I doubted it. But as they told us on the beginning of the course- "Chef is always right!". My shell turned out in one piece. It brings a smile to my face when things work. No matter how simple or mundane they are. Or maybe I am just happy knowing there's another slice of lemon cream tart waiting for me in the fridge! As I have mentioned before, I don't have the liberty to share recipes and techniques I learned from school. But I must say that Dorie's Lemon Cream Tart tastes really close to the version we make in school. And if you decide to be fancy, pipe and bake some french meringue shells and arrange them on top of the tart! Great look! 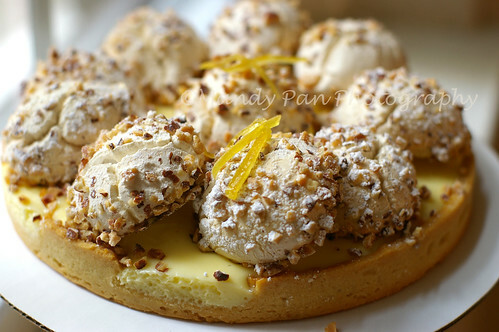 I never thought of putting crisp meringue on top of a lemon tart (I usually make a regular lemon meringue pie for my clan and it's such a fav that if I changed it there could be blood) but I like the idea now that I see it. Looks Wonderful! Tasty sounding too! Very pretty, and great presentation, much better than the weepy top normally found! I absolutely love that pierre herme lemon cream. Oh my gosh. This look so good. I'm uber-impressed. Your photos are always so enticing. The meringues looks so good. Everything does! 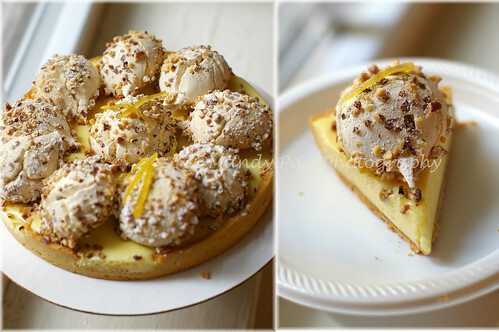 I am pretty picky about my lemon tarts and I think the one from the Tartine cookbook is the best, bar none. I haven't tried Dorie's though. Really looks good -- Im sure it tastes even better. Wow, you did a beautiful job! Looks great! And Lemon Tarts are fantastic! And yours is no exception. Crazy Beautiful!!! This amazing! Love it. Beautiful tart!! One of my weaknesses too! This is beautiful, I've never made Dories tart, I will have to now just to imagine how wonderful yours is! Next time I make a lemon tart I'm totally making meringues to go on top. That looks awesome!!! Nice looking tarts. Love the idea of putting merengie on top. Makes for a beautiful presentation and I bet the taste too. Mayer lemons would be perfect for this. I love the self-healing crust, too. That's my weakness too! I absolutely adore lemon desserts. Mandy, since we can't get to try out the recipe... how abt baking more then me come over to try it out. Nice Lemon Tart!Very presentable. I am drooling for it now . The lemon tart is very nice and tasty.